Last updated by Mark Jala at December 7 . Enamel surface eliminates the need to "season"
Lodge Enameled Cast Iron Mini Round Cocottes offer all the benefits of durable enameled cast iron in a compact, stylish design. A workhorse in the kitchen and a show piece on the dinner table. Whether starting with an appetizer or finishing a meal with a small dessert, this 10 ounce mini cocotte, which measures 5.06"L x 4.06"W x 3.13"H, offers exceptional versatility and convenient options for both preparation and serving. Long-lasting enamel that resists chipping and cracking, while its durable, nonreactive, nonporous, enamel interior offers a smooth surface for cooking and baking. Cast iron offers great heat distribution and superior heat retention so the cocotte will stay hot throughout the meal. Transitions easily from stovetop to oven. The cookware's cast-iron loop side handles ensure a secure grip during transport and its tight-fitting lid with an easy-grip knob helps trap heat, moisture and nutrients. The cocottes can be safely used in the oven up to 600 degrees. Use vegetable oil or cooking spray for better cooking and easier cleaning. The porcelain (glass) finish is hard, but can be chipped if banged or dropped. Interior protection must be used to prevent chipping if cookware is stacked. Although dishwasher safe, hand washing with warm soapy water is recommended to preserve the cookware’s original appearance. A flawless pairing of form and function, the Lodge Enameled Apple Pot is a classic way to both prepare and serve memorable meals. The 3.5 qt capacity is perfect for many dishes including soups, sides and pasta. Many great American chefs put Lodge Cast Iron on the list of the tem most essential tools in their kitchen. That's because Lodge Cast iron cooks best. Not even the most expensive stainless or aluminum cookware can rival the even heating, heat retention, versatility, value, and the durability of Lodge Cast Iron. Lodge Enamel brings together the Lodge 120 year history of making cast iron cookware with the fine art of enameling. The raw iron piece is hand prepared before several layers of enamel are applied and baked in very hight temperature ovens.The outstanding design allows the cookware to be taken from the stove or oven directly to the table. Lodge Enamel is dishwasher safe but hand washing keeps best appearance. Suitable for gas, electric, ceramic and induction cooktops on low to medium heat settings. Ideal for inside kitchen ovens - for best performance, use below 500 degrees. Measures 9-7/8 inches by 9 7/8 inches by 9 1/2 inches. Enamel Cast Iron made in China to Lodge specifications. 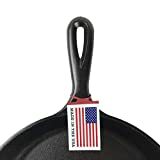 All other Lodge Cast Iron Cookware made in USA.